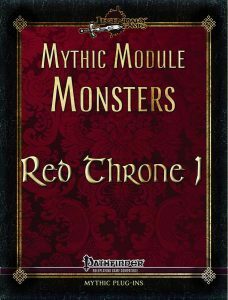 The first installment of the series of little pdfs providing mythic versions for the monsters originally featured in the bestiary sections of Curse of the Crimson Throne clocks in at 9 pages, 1 page front cover, 1 page editorial, 1 page SRD, leaving us with 6 pages, so let’s take a look! We begin with the Mythic Devilfish at CR 5/MR 2, who infuses tainted blood that can render nonevil creatures sickened and it also gains reactive camouflage and can increase the miss-chances it gets from it via mythic power expenditure. Really cool, though this guy will be familiar if you already have Mythic Monsters: Sea Monsters. At the same CR/MR, the carrion golem (including the Self-Repairing Construct feat, reprinted for your convenience) receives a more virulent plague and the limb ripper ability, which lets the monster…surprise, rip off limbs of targets it has hit, provided it has mythic power left. Nice, though a bit of a pity that we don’t cover the variants or construction notes here. If you btw. have Mythic Monsters: Halloween, it can be found inside that tome as well. At CR 3/MR 1, the raktavarna rakshasa is constantly under nondetection as well as the option to enchant itself as a vicious weapon, but fool the wielder into not realizing that…which is damn cool. However, if you already have the Mythic Monsters: India-file, you will already be familiar with this guy. At the same CR/MR, the soulbound doll’s mythic version can use ventriloquism and ghost sound to mimic voices and may use some bardic performances and may use Stealth while observed, potentially porting right next to its unwitting victims. Cool! That being said, no construction notes here either. The CR 1/MR 1 reefclaw is upgraded to be capable of potentially wrecking armor and also features the spines it should have had in the first place. Yes, they’re poisonous. Love this guy – one of my favorites herein! At the same CR/MR, the dream spider’s web penalizes Perception and weakens the Will of those caught in it and extends the webs to bursts – another winner! Editing and formatting are top-notch, I noticed no issues. Layout adheres to a really elegant and nice two-column full-color standard and the pdf has no artworks or bookmarks, but needs none at this length. Jason Nelson shows that he really knows his mythic material here – the builds are all interesting, the upgrades creative and cool. While the lack of construction notes for the constructs is a bit of a pity, at the more than fair price-point, that does not sink the pdf. However, if you do have a lot of the big books, this has less to offer for you. The builds are great, but whether or not this is worth getting for you depends. Hence, my final verdict will clock in at 3.5 stars, rounded up to 4 for the purpose of this platform – unless you already have most of the big files, in that case, you may want to round down. You can get this nice collection of critters here on OBS!